At opening of Sharjah Biennial 11, Sharjah Art Foundation announced seven artists as winners of Sharjah Biennial prize. Sharjah Art Foundation (SAF) announced the recipients of the 2013 Sharjah Biennial Prize on March 13 at the opening night of Sharjah Biennial 11, Re:emerge - Towards a New Cultural Cartography, on view through May 13, 2013. The seven winners of this yearʼs prize totaling $40,000 are Apichatpong Weerasethakul and Chai Siri, Tiffany Chung, Wael Shawky, Monir Shahroudy Farmanfarmaian, Magdi Mostafa, and Fumito Urabe. The 2013 prize jurors were Bassam El Baroni, a curator and art critic based in Alexandria, Egypt; Hu Fang, the Co-Founder and Artistic Director of Vitamin Creative Space and the Pavilion in Beijing, China; and Sarat Maharaj, Professor of Visual Art & Knowledge Systems, Lund University & the Malmö Art Academies, Sweden. The award for an outstanding contribution to Sharjah Biennial 11 (SB11) was presented to Apichatpong Weerasethakul and Chai Siri—two artists devoted to independent and experimental filmmaking—for the video Dilbar (2013), a portrait of a Bangladeshi builder working on the new art spaces of the Sharjah Art Foundation. Two awards were presented for an exceptional contribution to SB11, the first to Tiffany Chung, for her ink- and oil-based coloured cartographic drawing and installation works examining conflict, migration, urban progress, and transformation in relation to history and cultural memory. The second was given to Wael Shawky for Dictums 10:120, a multi-part project in which a chorus performs a traditional qawwali song, comprised of fragments of curatorial text from the last Sharjah Biennial, translated into Urdu. A special recognition award for a practice sustained over many decades was presented to Monir Shahroudy Farmanfarmaian, who has had a long career creating work with a strong connection to the history of Iranian reverse-glass painting and mirror mosaics, a craft traditionally passed on from father to son. Additionally, two awards were presented for an artist whose work shows promise: Magdi Mostafa, for sounds cells: FRIDAYS (2010), an abstract evocation of the artistʼs Cairo neighbourhood, Ardellawa, as heard on Fridays, a day of prayer and household chores; and Fumito Urabe, for Drifting Through (2013), an installation of found objects that explores the intersection of Eastern philosophy and contemporary art. Sharjah Biennial 11 opened Wednesday, March 13, with a public ceremony in the presence of HH Sheikh Dr Sultan Bin Mohammed Al Qasimi, Member of the UAE Supreme Council and Ruler of Sharjah, and Sharjah Art Foundation President HE Sheikha Hoor Al Qasimi, along with Sharjah Biennial 11 Curator Yuko Hasegawa. 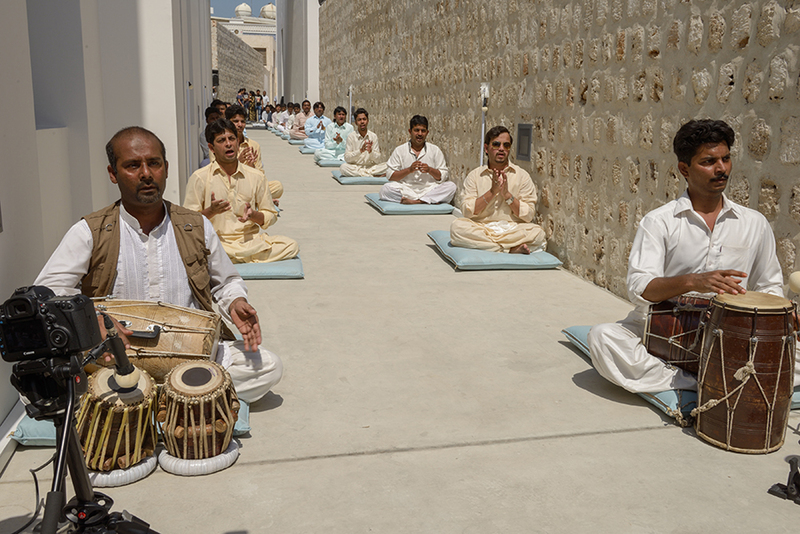 SAFʼs five new multi-functional art spaces in the Sharjah Heritage Area were inaugurated on opening day, and a schedule of performances included Terra Incognita, et cetera, by Tintin Wulia; performances by Otobong Nkanga and Tony Chakar; and Within, an SB11-commissioned sound performance composed by Tarek Atoui, featuring 10 drummers and an electronic musician fortissimo, followed by variations for three string performers, progressing spatially from outskirts of Sharjah Heritage Area into the public courtyards. Opening week events continue 14 March through 17, including performances, films, lectures, and the annual March Meeting, a symposium featuring presentations, thematic sessions, and panels that will contextualise the concept of SB11. Inspired by the courtyard in Islamic architecture—in particular the historical courtyards of Sharjah, where elements of both public and private life intertwine—SB11 Curator Yuko Hasegawa proposes for SB11 a new cultural cartography that reconsiders the relationships between the Arab world, Asia, the Far East, through North Africa to Latin America. Some of the March Meeting 2013 speakers include: Samir Amin, President, World Forum for Alternatives, Senegal; Hu Fang; Patrick D. Flores, Curator, Vargas Museum, Philippines; Paulo Herkenhoff, Director, Museu de Arte do Rio (MAR), Brazil; and Sarat Maharaj. The opening of SB11 marks the inauguration of SAFʼs five new multi-functional art spaces in the Sharjah Heritage Area which have been in development since 2009. With approximately 20,000 square feet of interior space, connected by open-air courtyards and rooftop terraces, these new spaces will provide venues for SAFʼs growing activities and the increasing needs of its community. Curated by Thai filmmaker Apichatpong Weerasethakul, it features programming by leading figures in the film industry, including Steve Anker, Dean of the School of Film/Video at California Institute of the Arts (CalArts), Los Angeles; Khavn De La Cruz, Poet, Pianist, Filmmaker, Mondomanila, the Philippines; Ali Jaafar, Executive Director, Independent Film Division, Quinta Communications, London; Mehelli Modi, Founder of Second Run DVD, London; Alcino Leite Neto, Editor, Sao Paulo; Jean-Pierre Rehm, Theorist, Festival director, FIDMarseille, Paris; Tilda Swinton, Scotland; and Apichatpong Weerasethakul, Film Director/Producer, Chiang Mai, Thailand. The SB11 Film Programme screenings will take place over the course of the Biennial in the Mirage City Cinema, a cinema-architecture space by Apichatpong Weerasethakul and architect Ole Scheeren, commissioned by Sharjah Art Foundation. International and regional artists are featured in a series of music and performance events that take place throughout SB11. Highlights include an SB11-commissioned solo performance by Egyptian artist Hassan Khan; a performance by Shahzia Sikander; a Skype-based dance performance by Tunisian dancer and choreographer duo Selma and Sofiane Ouissi; a performance by Wael Shawky, Dictums 10:120; and a work by alva noto with a special appearance by Ryuichi Sakamoto which offers an audio-visual performance of his 2011 album univrs. The Sharjah Biennial Prize was established by the Sharjah Biennial in 1993 and is now awarded by Sharjah Art Foundation. The honoured recipients are selected by a distinguished jury appointed by SAF. The Sharjah Biennial Prize is given upon the juryʼs sole discretion and can be granted to any number of artists.